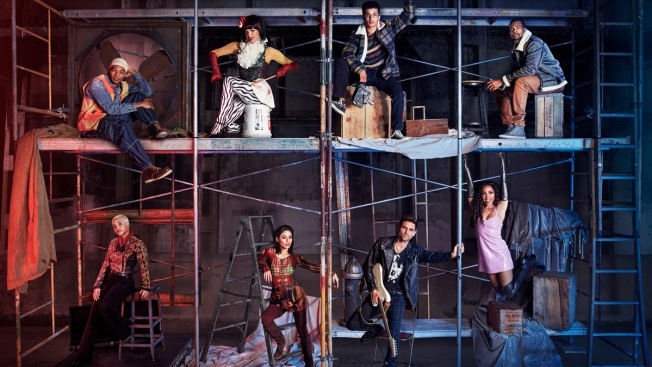 The cast included Broadway veteran Brandon Victor Dixon, recording artists Tinashe and Mario and Vanessa Hudgens of "High School Musical"
This image released by Fox shows the cast of "Rent," from top left, Brandon Victor Dixon as Tom Collins, Valentina as Angel Dumont Schunard, Jordan Fisher as Mark Cohen, Mario as Benjamin Coffin III, and from bottom left, Kiersey Clemons as Joanne Jefferson, Vanessa Hudgens as Maureen Johnson, Brennin Hunt as Roger Davis and Tinashe as Mimi Marquez, airing Sunday, Jan. 27 on Fox. One of the stars of the live broadcast of the musical "Rent" on Fox was injured during a rehearsal Saturday, forcing the producers to use pre-recorded material Sunday night. Brennin Hunt, who plays the role of rocker Roger Davis, broke his right foot. The show used Saturday night's pre-taped show, only switching to live for the finale. Hunt competed in "The X-Factor" and appeared in "Nashville." He played the part in "Rent" originated by Adam Pascal. The high-energy rock musical by Jonathan Larson celebrates survival among the artists and homeless of New York's East Village. It features the memorable songs "Seasons of Love" and "Another Day." The cast also includes Broadway veteran Brandon Victor Dixon, recording artists Tinashe and Mario and Vanessa Hudgens of "High School Musical." In a statement, the playwright's sister, Julie Larson, said the "new cast has embodied the spirit of the show from day one and they embraced Brennin with positive and uplifting love in his moment of need."